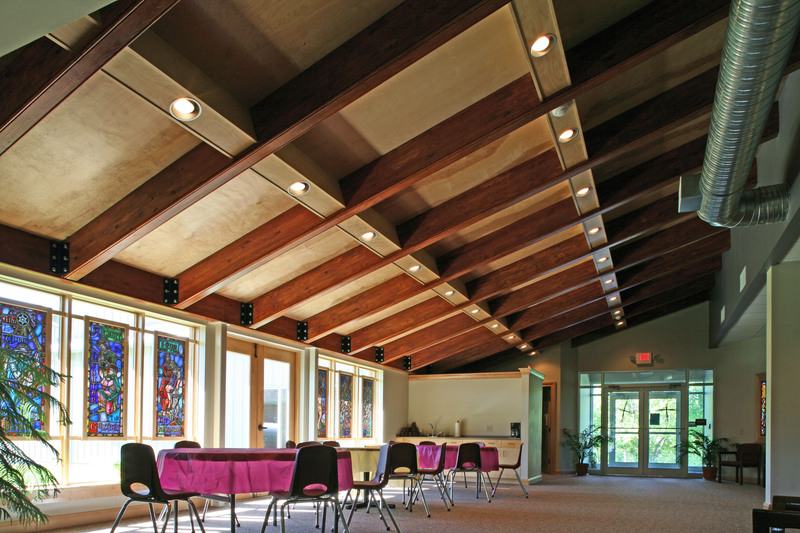 This church needed a large multi-purpose room addition accomplished within a small budget, for non-liturgical church functions and use by community groups. Our design/build team felt the right way to proceed was to use a pre-engineered metal building. As we created the building design, we worked with the contractor to find the most cost-effective ways to accomplish the expansion, including the use of stock factory materials for the exterior stucco and metal siding. Through color selections and exterior finishing we kept a cohesive exterior appearance between the original building and the new addition. The pitched ceiling with exposed stained, wooden beams is practical and decorative as it connects the new addition to the original building while introducing a rich interior design feature into the new space. The new addition gives the congregation room for a coffee station near the narthex, flexible seating space, large open areas, larger restrooms, and more storage. Stained glass window panels removed from the sanctuary during the expansion are reused in the new building. 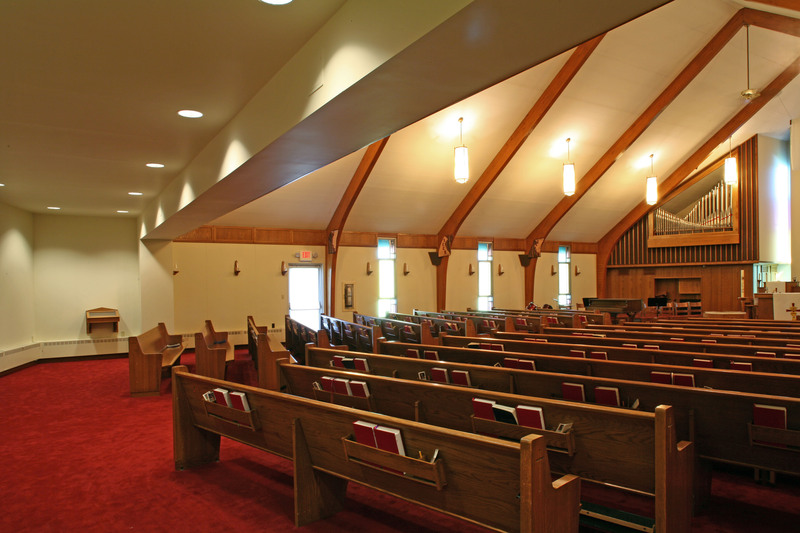 In the main sanctuary expansion, additional pews were added where the rear wall was removed. An open area was created behind the pews where stackable chairs are kept for use when over-capacity attendance requires additional seating. The large, rear ceiling beam is actually part of the new, pre-engineered structure behind the sanctuary. The wood tones used in the sanctuary are sustained in the new addition, adding consistency between the old and new parts of the church. 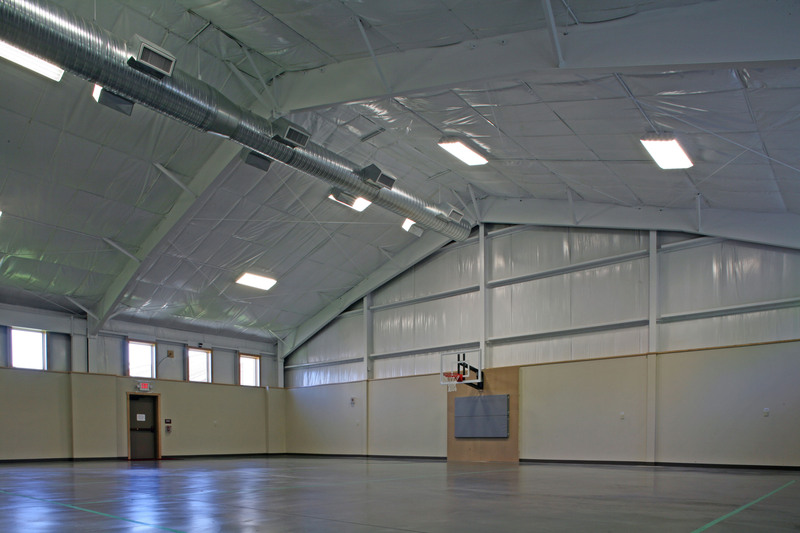 The new large gymnasium gets a lot of use for church functions, community groups, sporting events of local organizations, and the churches’ child care facility that uses it for indoor recreation. Adjacent to the gymnasium is a commercial kitchen, food pantry, large storage areas, and new larger restrooms. An exterior loading platform makes it easy to receive deliveries of all sizes. A connecting door to the narthex can be locked off to increase security during non-church events. Our architectural rendering at the start of the project enabled the building committee, contractor, and church members to visualize the final result prior to starting the project. It was significant in getting consensus for the project and raising the funds needed for the expansion.